Yep, I did. My crazy valentine-loving mind wanted brownies, sprinkles, chocolate covered, and candy yumminess all in one. And I totally made it happen. Let me tell you more whilst floating on cloud 9. 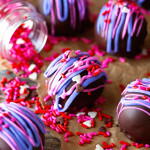 Just in case you’re wondering, I stuffed my truffles with Hershey’s Cookie & Cream Kisses. I love the color contrast and the added “cookie bonus”. When you decide to give them a go, you can hide any candy inside that you please. You can even switch things up and envelope different kinds of candy. The possibilities are endless and totally customizable. Really hard to mess up – I’m sure whatever you choose will be incredibly delectable. 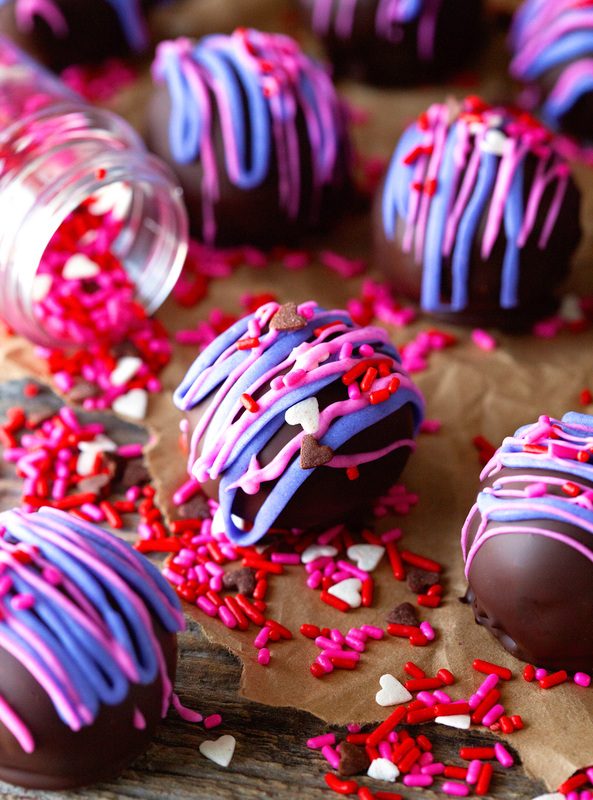 Making truffles never gets old. I just love the fact that they’re perfect to prepare ahead of time, require almost no skills, and are always impressive. The fact that they’re a true crowd-pleaser doesn’t hurt either ;). Which makes them also pretty dangerous. I can never quite believe my eyes how quickly they disappear. There’s something about small bites of awesomeness that’s attractive to most people. So wherever you are and whatever you do tomorrow, I sure hope you are feeling the love. Oh, and spoil yourself with something cute, colorful and oh so good ;). 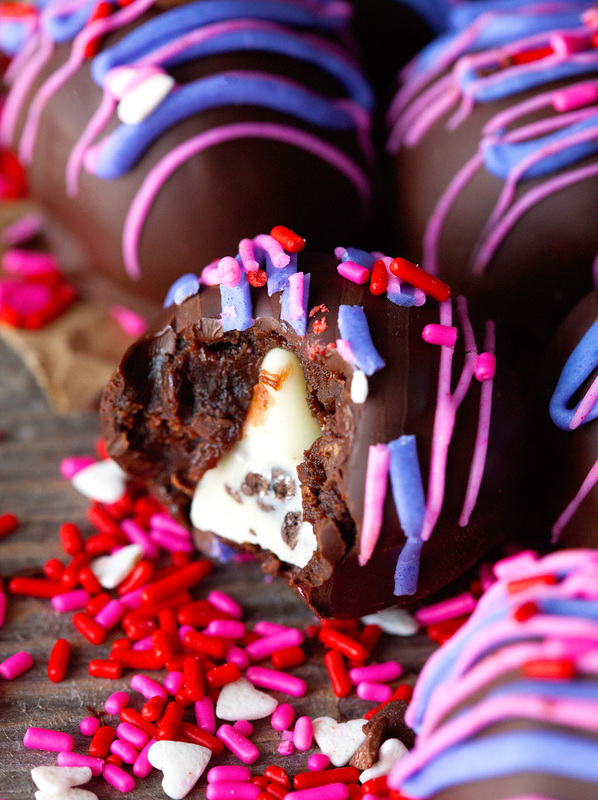 Surprise your loved ones with these fun and scrumptious brownies truffles. Young and old alike won't be able to get enough of these! 1. Prepare the brownies according to package instructions. Let cool completely before moving on to the next step. 2. Using a fork or your hands, break the pan of brownies into fine crumbs into a large bowl. Add softened cream cheese and knead gently with your hands until cream cheese is fully incorporated. 3. Divide brownie mixture into 18 equal portions (using a large cookie scoop), place a kiss into the middle of each portion, roll into 18 brownie balls and place on a wax paper-lined baking sheet. Place in the fridge to chill while you prepare the chocolate. 4. Heat chocolate in a heatproof bowl until completely melted. Add oil, if using, and stir to combine. 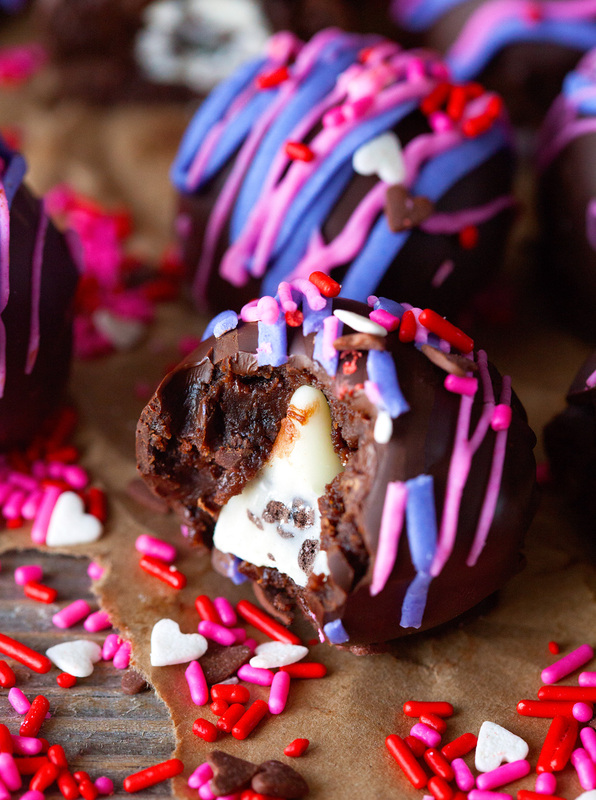 Remove brownie balls form the fridge and place one ball at a time into the melted chocolate. 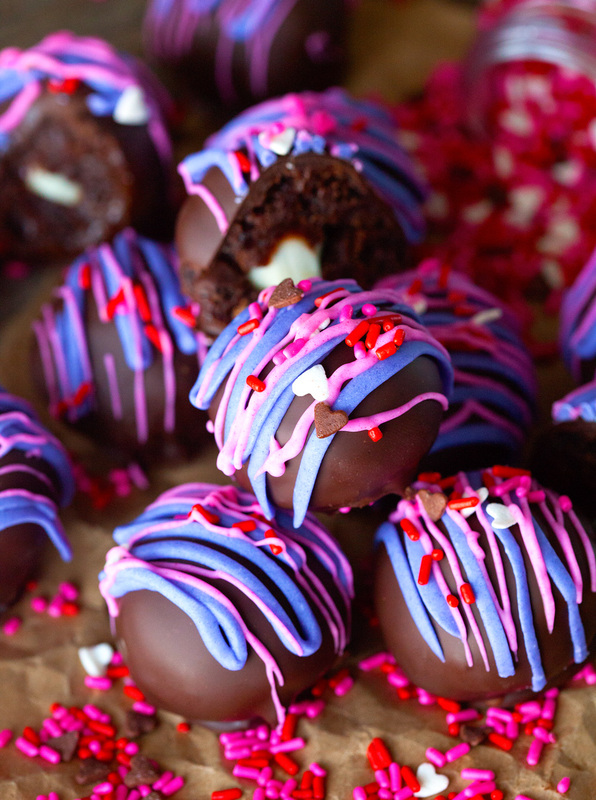 Using a fork, evenly coat each ball with the chocolate. Use the fork to remove the truffle from the chocolate and before transferring it back to the baking sheet, slightly tap the fork against the side of the bowl to get rid of any excess chocolate. Place on the baking sheet and repeat with remaining brownie balls. 5. In another heatproof, melt white chocolate chips. Divide in two (pour half of the melted chocolate chips in a separate bowl) and add as much food coloring as needed to reach the desired color - stir thoroughly. I used pink and dark purple. Pour melted chocolate into a small ziptop bag(s), cut off one corner and pipe melted chocolate in desired design on top. Add sprinkles. Let truffles sit for 30 minutes until set (or place in the fridge to speed up the process). 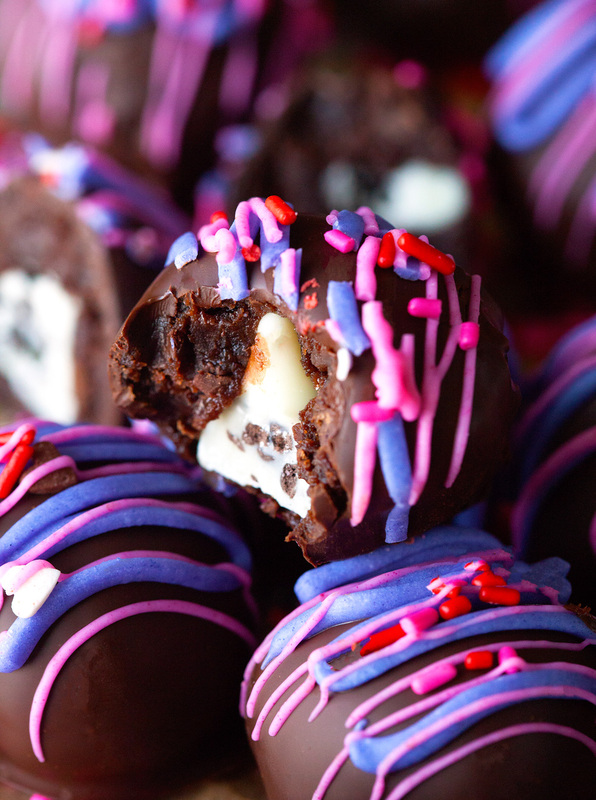 Brownie Truffles will keep up to 5 days stored in the fridge. What a perfect treat to make tomorrow! These look beyond delicious! These look delicious, will try really soon!!! 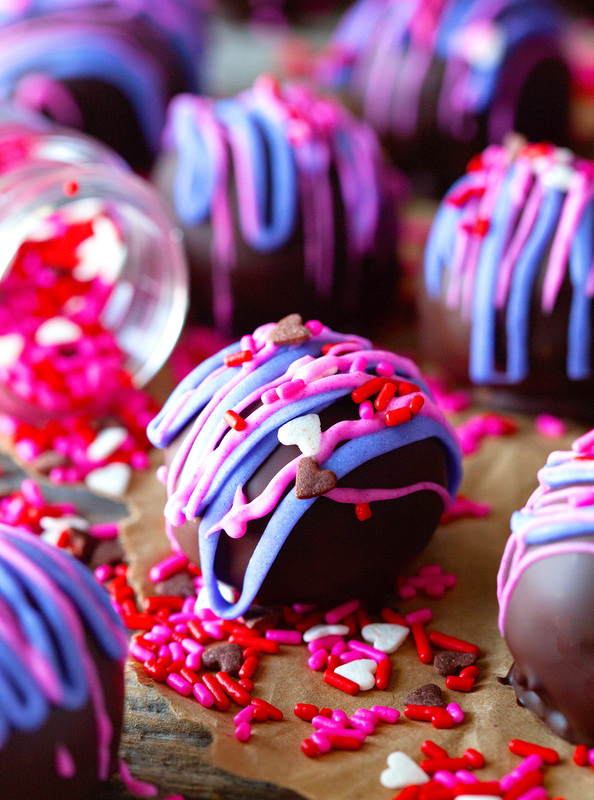 These brownie truffles look divine! And I love all the sprinkle action and bright icing going on over the top. How cute! I love that little kiss on the inside! Thanks for letting me know. I updated the recipe! That was one fun brownie for eating!